Finding the right thread to use for Mountmellick embroidery can be very difficult. You can’t use regular embroidery floss because it is shiny, and is made up of separate strands and doesn’t work right. You can’t use pearl cotton because its way too shiny for Mountmellick. You also can’t use coton a broder (broder cotton) or cotton floche because even though they don’t seem particularly shiny compared to other threads, they are still too shiny. That’s why Vetty Creations sells the proper thread to use – so you don’t have to search high and low for it! The Mountmellick thread that we sell was specially developed in conjunction with a noted Irish teacher of Mountmellick embroidery, Maree Maher. It is manufactured specifically for Mountmellick embroidery, so you know its the right thread to use. Mountmellick thread is very different to other types of embroidery thread. For starters it is completely matt. It has no shine at all. The threads are made of multiple strands, finely twisted together to create a smooth surface. The threads are never divided though – the strands are not meant to be separated. it is always white, and only white. that the thickest Mountmellick thread (just above the pearl cotton) is about the same thickness as the pearl cotton. Then the threads above it get progressively thinner. that the pearl cotton has shine, whereas the Mountmellick thread does not. that the surface of the Mountmellick thread is much smoother than the pearl cotton. While the pearl cotton has two clearly visible ply, the Mountmellick threads are made up of multiple thinner ply, which means when combined, they provide a much smoother surface. This thread is made of 4 ply. It is used for fine detail work. Because Mountmellick is not dainty embroidery – it is big and bold – this thread is too fine to use for the bulk of Mountmellick embroidery. This thread is made of 6 ply, making it quite a bit thicker than No 2. 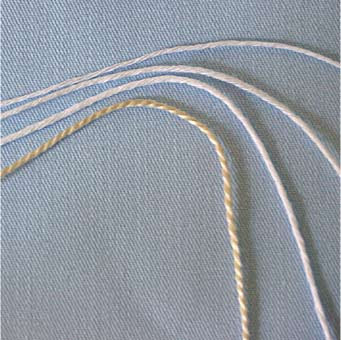 No 3 thread is used for the bulk of Mountmellick embroidery. Many people find it a little different to stitch with, than what they are used to. This is because it is really quite a thick thread, and can take some getting used to. This thread is made of 7 ply. It is used for padding and areas of very bold detail. For large scale projects such as bedspreads and coverlets, the entire design could be worked in No 4 thread because they are large projects and large scale stitching is therefore very appropriate. The thread has a habit of becoming untwisted a little as you stitch (simply because it is such a soft twist), so you may need to be vigilant about retwisting it, if need be. 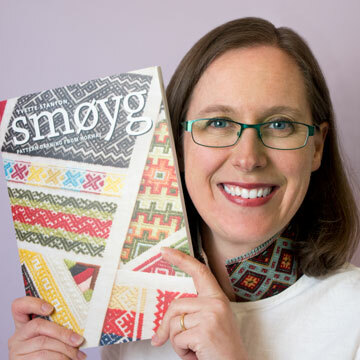 If you need to undo any stitching (though I’m sure you’d never need to do that!) retain the thread, though it will be furry, as it can be used for padding. Its furriness won’t be seen beneath the covering stitching. Keep in mind that Mountmellick thread can be used for any stitching where you would like a matt white thread. It can be used for other styles other than Mountmellick! You could use it on a whitework sampler where you wanted some contrast between shiny thread and matt thread. No 2 thread would work very well for any needlework where fine, soft white thread is needed, such as for broderie anglaise. It is such a lovely soft thread, and is well worth trying! Purchase Mountmellick thread from Vetty Creations today and try it for yourself! Thank you som much Yvette for this information, I am excited to try the threads.